I love this design Sylvie, so pretty and with lots of sparkle and shimmer too, thanks for joining in my theme this week. 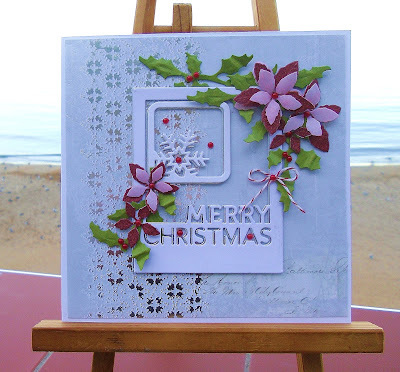 Beautiful festive card, I lve the color combination. Love this card and the colors you used are awesome!!! Thank you for your kind comment on my blog. I am now following you too!!! This is a pretty shimmery card with lovely non traditional colours. I am loving those pretty poinsettias. Such a pretty card and well done on your sales.